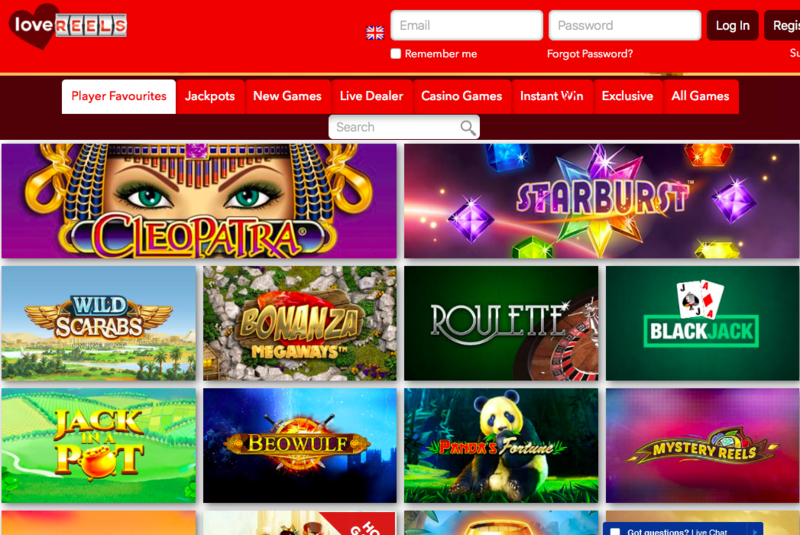 Love Reels is another Nektan online casino that feels like almost every other that we’ve seen in recent years, and it’s fair to say there’s been a few! Truly one of the most prolific operators in the iGaming world, Nektan clearly chose quantity over quality as their motto some time ago, and they have been proving how unsuccessful that choice is ever since. There were a few sites from Nektan recently that gave us hope, they weren’t amazing or anything, and they certainly weren’t unique, but they can at least be described as different from their network brethren. However, any optimism attached to these online casino releases has been swiftly quashed with the addition of Love Reels to the Nektan portfolio, a site that proves that absolutely nothing has changed. Nektan have been doing this for so long now, releasing site after site that looks the same, and has the exact same collection of games, and normally even the same promotions, so there is nothing to tell any Nektan site from the next. That would be easier to stomach if these online casinos could be competitive in the wider market, but they can’t, apart from a decent game selection, no Nektan site brings anything else to the table, and that’s something that has become more depressing the longer it has gone on for. One of the newest collections to the Nektan portfolio, Love Reels is barely distinguishable from any other site on the network. The layout is exactly the same, meaning hat the design based around the theme is the only unique aspect of this site, and it’s hardly unique, and certainly isn’t impressive. Love is the concept here, as proven by the heart in the logo, and very little else, it could be argued that the red colour scheme continues the theme, but to be honest, it’s just a red colour scheme, no more than that. To make things worse, as you scroll down the page, that colour scheme stops, and is replaced by a plain white background behind the traditional thumbnails on the homepage. There have been cases where this has been a good choice, when allowing the games to take centre stage has added to the design of a site, but that isn’t the case here. That’s true for two reasons, firstly because the lack of decent design anywhere else on the site has a spotlight put on it by the quality of the design of the games, and secondly, these thumbnails are in the same order as they are at every other Nektan site, so there’s nothing to get excited about here, again. 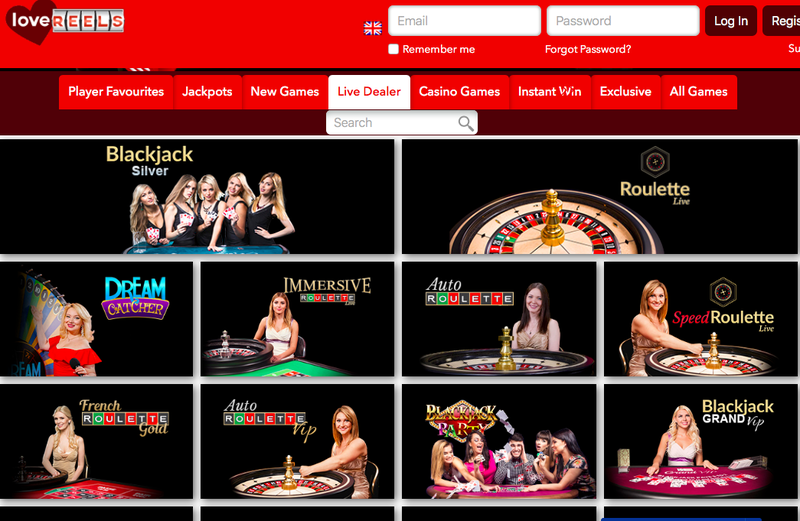 The selection of games on offer at Love Reels is undoubtedly impressive, when observed independently from the rest of the online casino site. Titles from 1X2 Network, Betdigital, Big Time Gaming, Blueprint Gaming, Core Gaming, edict egaming, ELK Studios, Evolution, Extreme Live Gaming, Eyecon, Gamevy, IGT, IWG, NetEnt, NextGen Gaming, Pragmatic Play, Microgaming, Realistic Games, Red Tiger Gaming, SG Digital, SG Gaming, Williams Interactive, and Yggdrasil as well as proprietary Nektan software mean there is a wide array of games available here, from slots, to table and card games, to live dealer options, to a variety of instant win games. If it wasn’t for the fact that we’ve seen this same portfolio at games at almost every Nektan site, and the fact that Love Reels has nothing else to offer that isn’t immensely disappointing, this might be enough to save this site, but it isn’t. Love Reels is yet another lacklustre addition to an endless stream of awful sites from Nektan.